First Line: The world whipped by in a blur of color. As part of the FBI's elite K-9 unit, Meg and Hawk can find themselves anywhere at a moment's notice. Hawk is a pro at sniffing out bodies-- alive or dead-- and he and Meg are certainly put to the test when a bomb rips apart a government building on the National Mall in Washington, DC. After working non-stop to locate and save those buried in the rubble, Meg and Hawk are being hailed as heroes, but they cannot rest on their laurels. The bomber is still at large, more bombs are detonated, and the body count is rising. The partners are now part of a task force dedicated to stopping the killer, but it's going to take all their wits and survival skills to bring this reign of terror to an end. We're beginning to see an upsurge in mysteries featuring working dogs, and I'm glad. Whether they're police dogs, war dogs, or search and rescue, dogs bring a whole new dynamic to crime-solving duos. Having read some excellent mysteries featuring human/canine teams (from authors such as Margaret Mizushima, Robert Crais, and James Rollins) I eagerly picked up Sara Driscoll's Lone Wolf. 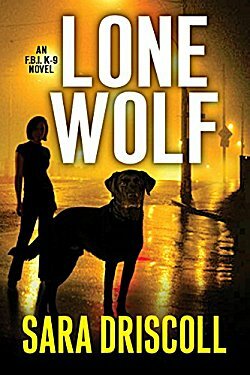 "Sara Driscoll" is actually the writing team of Jen Danna and Ann Vanderlaan, and Lone Wolf is the first book in the FBI K-9 series. The two have set up quite a good cast: Meg and her canine partner Hawk, Meg's sister Cara, Brian and his canine partner Lacey, and two men providing a bit of romantic interest, Clay McCord and Todd Webb. There is some interesting interplay between these people, and I especially liked the fact that Meg is the sort of character who's willing to go above and beyond the call as well as think outside the box. Also-- wonder of wonders-- the bosses in Meg's division are good, something that seldom seems to happen in crime fiction. The final action scene is a good one, but I felt there were a couple of hiccups in the book. The pace is uneven, and there are some awkward bits where we're allowed inside the mind of the bomber only to have his thoughts interpreted by the good guys in the next chapter. This is not only needless, it slows down the action. Perhaps the biggest hiccup for me was the dogs themselves. There wasn't enough "canine presence" to suit me during the actual manhunt. Yes, we get to "interact" with Hawk and Lacey in the dog park, and the authors use K-9 search terminology as chapter headings, but I'd really like to see more of the dogs working the actual case. I'm very interested in seeing what happens in the second book in the series. Hmm...those do sound like hiccups, Cathy. You know, I hadn't thought of the uptick in novels featuring working dogs, but I do see your point. And when they're there, I want to know more about them, too. It's one of the things that makes the premise of this one interesting. Yes, the dogs were what drew me to the book in the first place, and sometimes I got the feeling that the authors didn't know enough about what they did to actually write about it.